NCLC’s Clear Lake property is a 46-acre gem that features what was the final undeveloped interdunal lake on the Warrenton peninsula outside of Fort Stevens State Park. The 7-acre lake on the property is surrounded by dune ridges featuring a spruce- and alder-dominated forest, as well as emergent and forested wetlands. We chose to steward this property due to the fascinating changes that we learned were in store for it over the coming years. 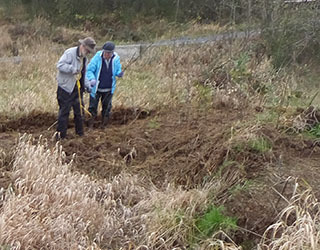 As part of NCLC’s funding agreement with the Department of State Lands, a large restoration process was carried out on this site to fulfill its role as a wetland mitigation bank. We have had the opportunity to see how the property has changed from a heavy industrial site, as thousands of yards of old sand dunes were removed by huge excavators and dump trucks and a series of NCLC work parties have planted hundreds of native trees, shrubs, grasses, and sedges. Now we’re witnessing a new wetland mature, with a variety of native plants and wildlife: from nesting and soaring eagles to feisty Canada geese defending their young; from beavers building lodges to deer and elk feeding on the new shoots. The wetlands also support a robust population of red-legged frogs. However, the mosquitos? Those we could do without, though even they are part of the complex web of life that’s being reestablished at Clear Lake. The changes we’ve been able to witness have been dramatic over the past few years at Clear Lake. We’re grateful to be able to witness and contribute in our small way to the return of this site to a productive and complex upland and wetland part of the coastal environment.